The first genuinely dessert Blackcurrant! A variety that has been hotly anticipated for some time and an entirely unique variety. 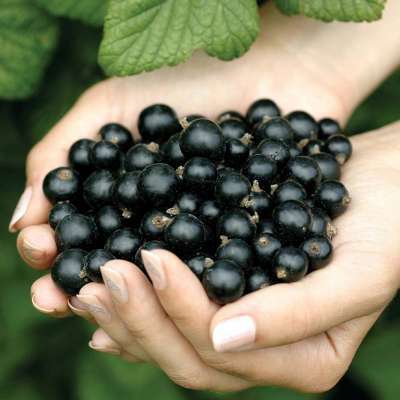 Ebony has a taste that is so sweet and mild it is the first Blackcurrant that can truly be used for dessert use and may even be eaten straight from the bush! Thin skinned, juicy and sweet but still with that unmistakeable Blackcurrant aroma, Ebony is ideal for adding to fresh fruit salads, cordials, punches and such like but can also be used for all culinary purposes and is valuable where less sugar is desired. Perfect for juicing with no added sugar required. The bush is only moderately vigorous and easy to manage, with useful resistance to mildew. Plant 3.5-4' apart.